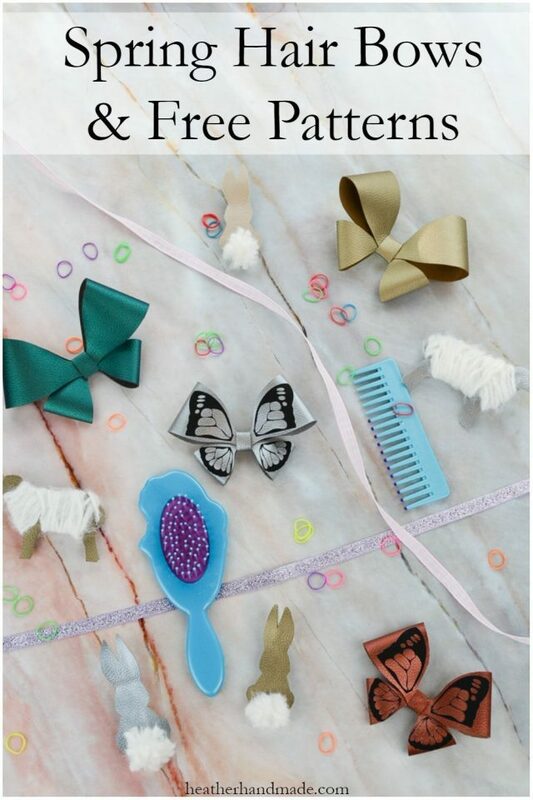 With these free hair bows patterns you can make the cutest, coordinating Easter Hair bows! 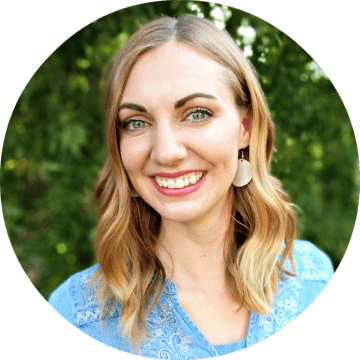 I love creating cute accessories and clothes with a touch of whimsy and interest. One of my favorite things to do is add cute animal details to the clothes and outfits I make for my children. 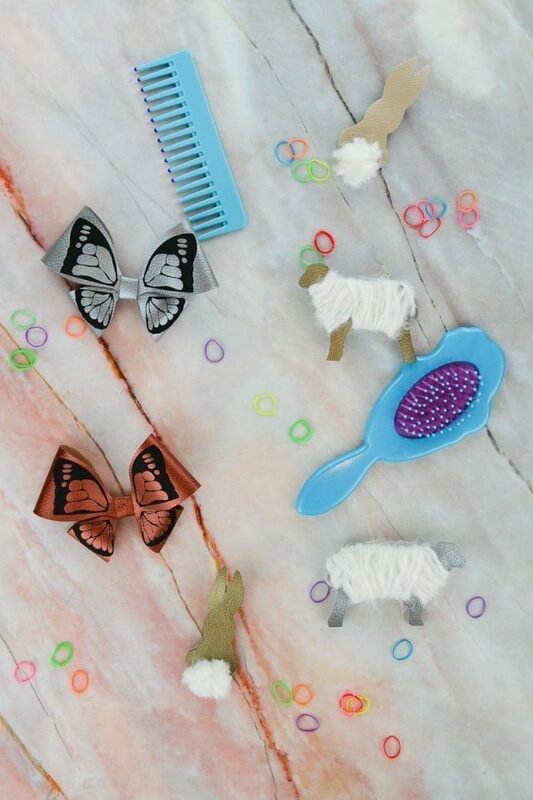 I designed some fun hair bows for Easter patterned after the common Spring animals: a bunny, a lamb, and a butterfly. 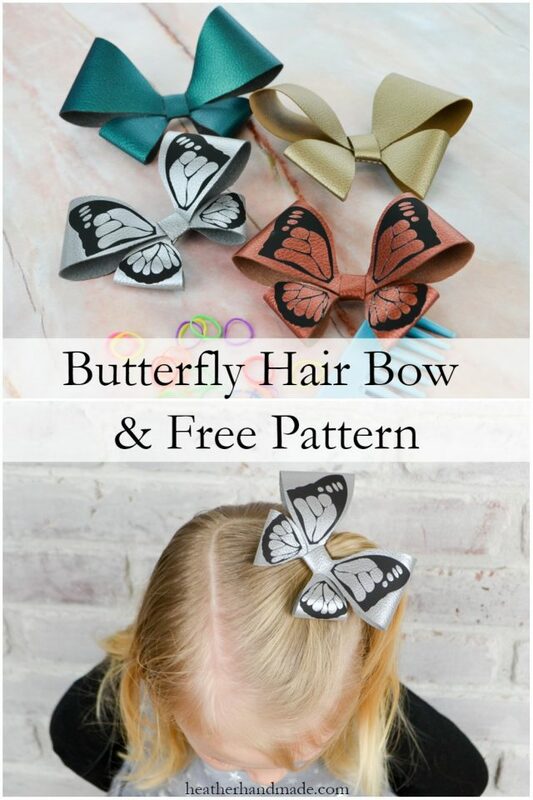 It would be so fun to coordinate the colors of these hair bows with your Easter outfits! 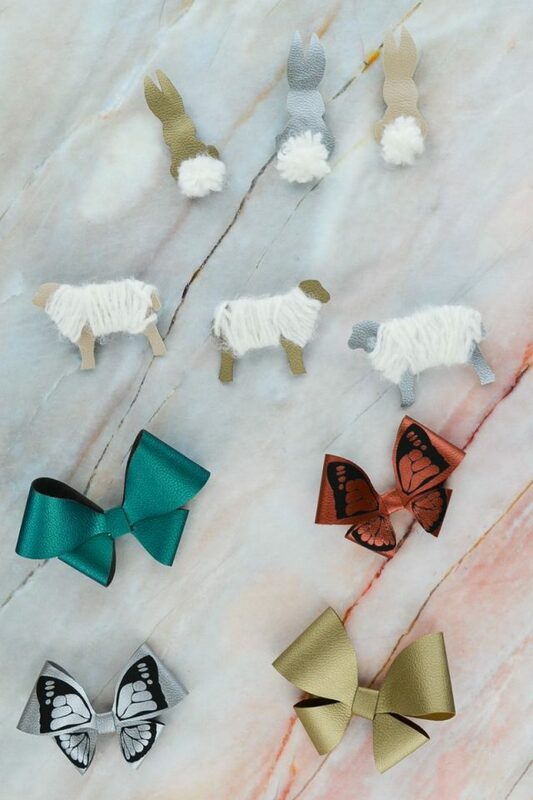 This isn’t the first time I’ve made animal hair bows. I shared some free patterns for other designs last year! I was an animal lover as a kid, and I still am. It really shows in my sewing practice because I’ve made a cat romper, a wolf coat, a puppy dog coat, a lizard coat, and bunny baby boots. I’m sure there are even more sewing projects that I can’t think of! 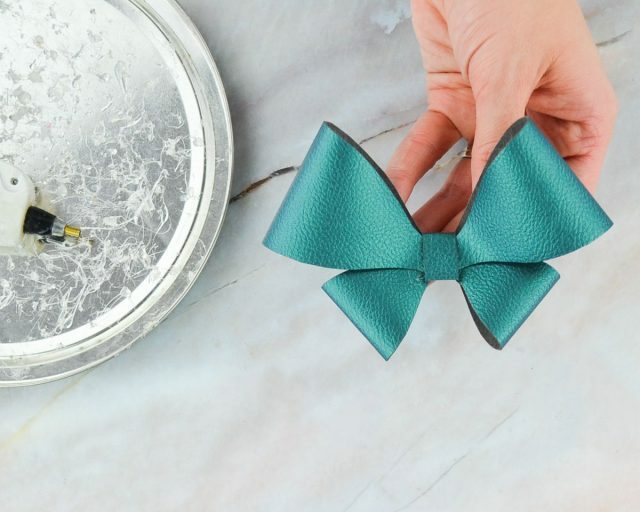 I made half of these bows by tracing and cutting them by hand. The other half I cut with my Cricut Maker. I wanted to see how they compared, and they were both quick and easy to do. 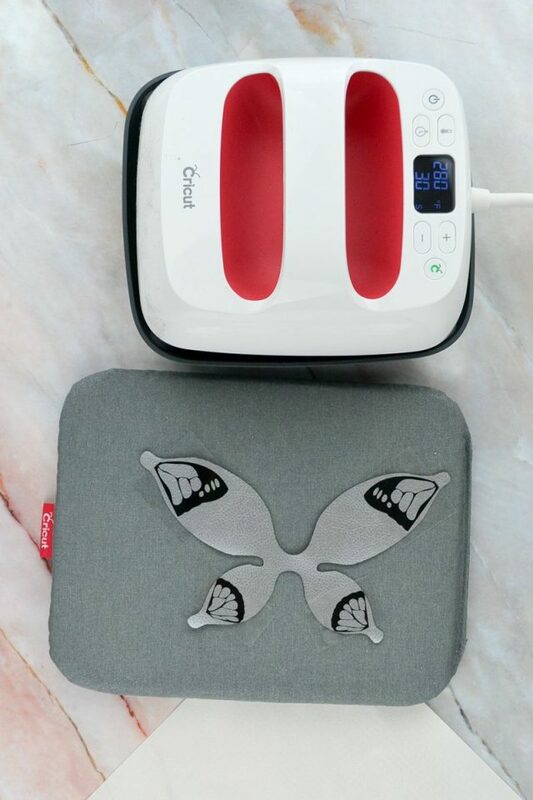 The butterfly iron-on vinyl detail can only be done with a cutting machine, but everything else can be done without a cutting machine. 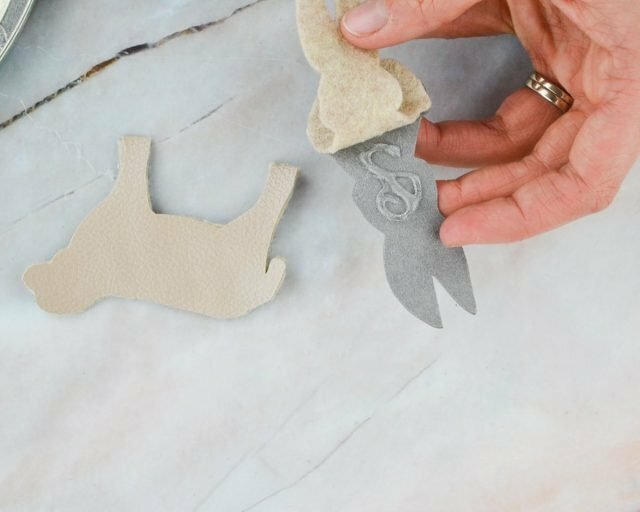 Cut out a bunny from leather or faux leather. Cut out another bunny from craft felt. This can be done by hand or with a cutting machine. Hot glue the felt to the back of the faux leather to make the bunny thick and stiff. 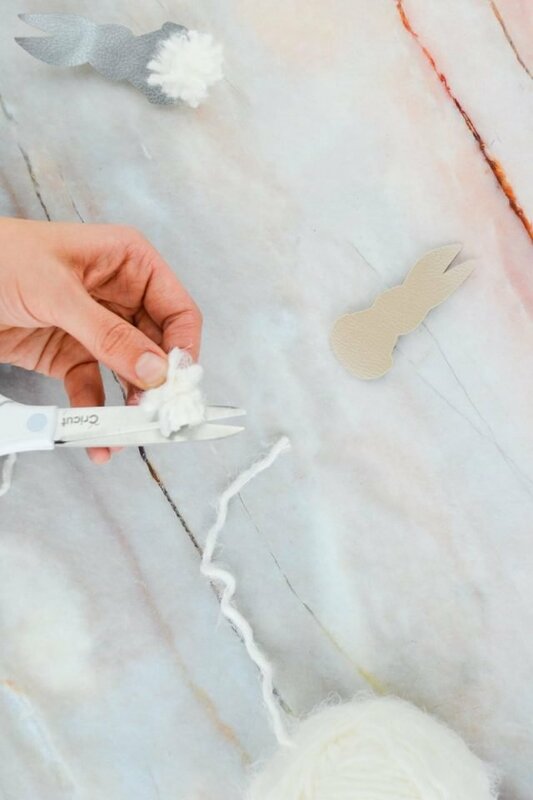 Make sure when you are gluing to flatten the bunny for the right shape. 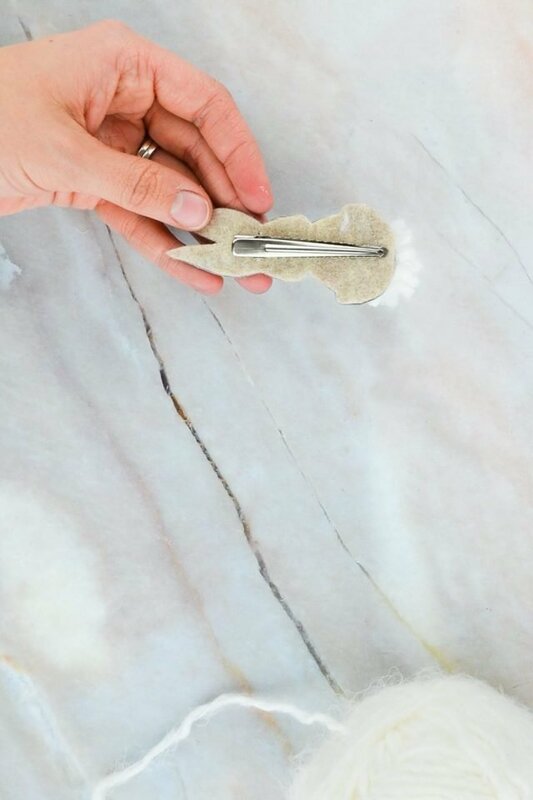 Wrap the yard 10-15 times around your finger. Wrap the two ends around the ball and tie off tightly. Cut through all the loops to form a pompom. Trim any long ends so that the pompom is uniform. 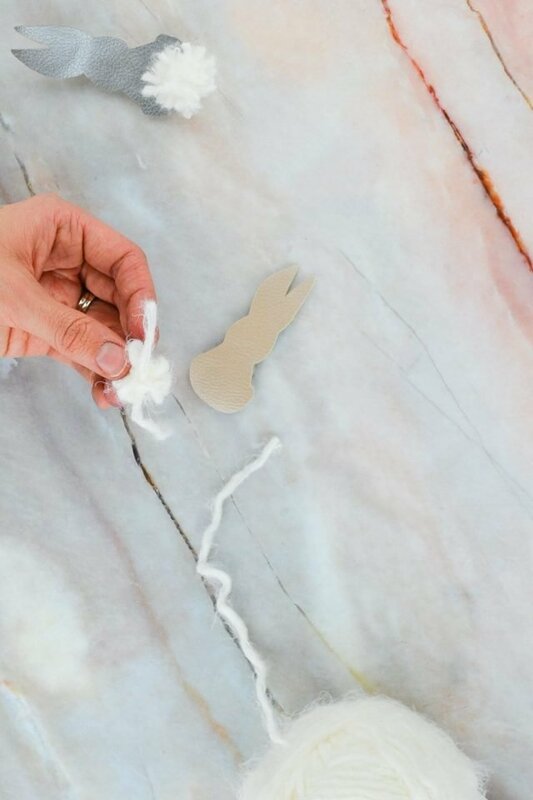 Hot glue the pompom to the bunny where the tail would go. Hot glue an alligator clip to the back of the bunny on the felt. 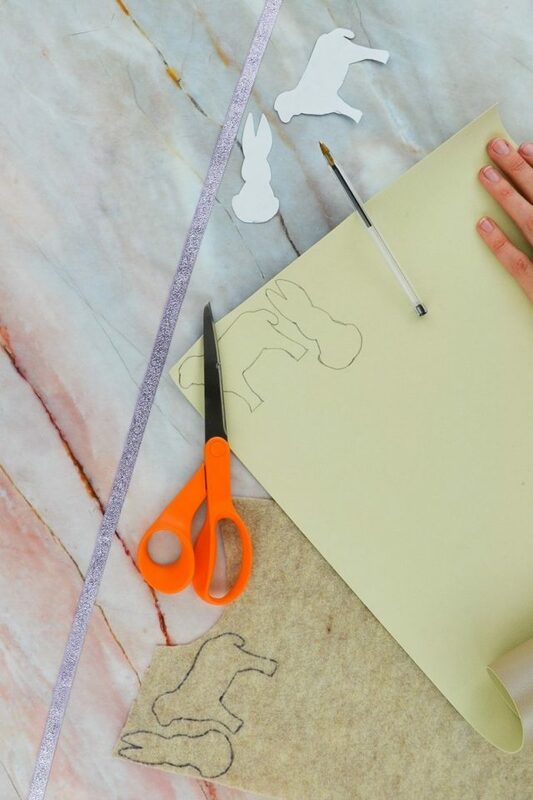 Cut out one lamb from faux leather or leather. Cut out one lamb from craft felt. This can be done by hand or with a cutting machine. 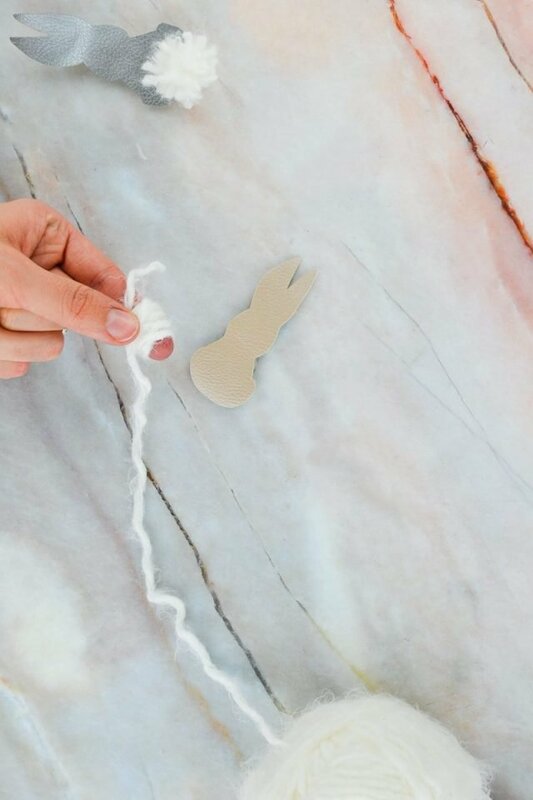 Hot glue the felt lamb to the back of the faux leather lamb. 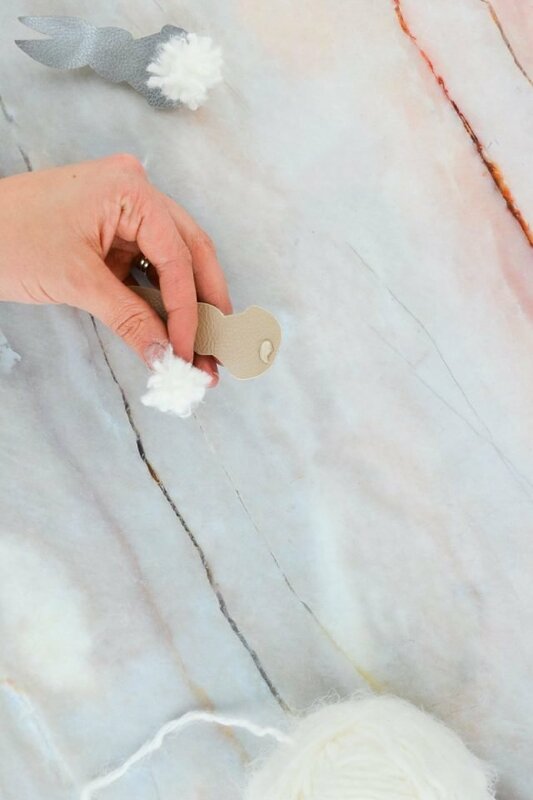 Make sure the you glue it flat to get the right shape. Hot glue an end of the yarn to the back of the lamb. 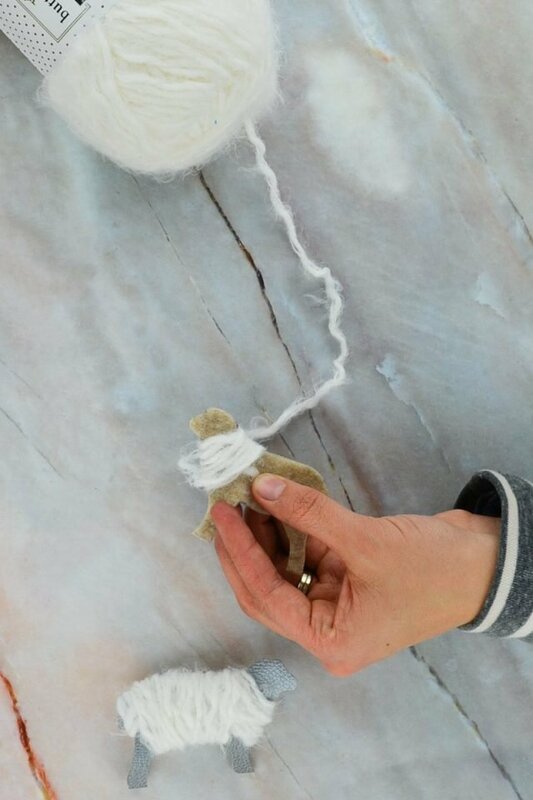 Wrap the yarn around the lamb mimicking the wool area of a sheep. 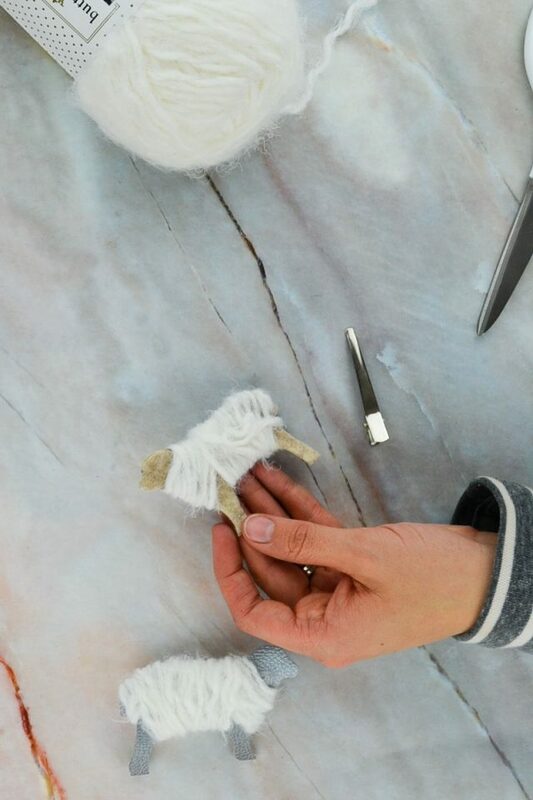 Keep wrapping until the lamb is nice and fluffy. Cut the yard and hot glue it to the back of the lamb on the felt. 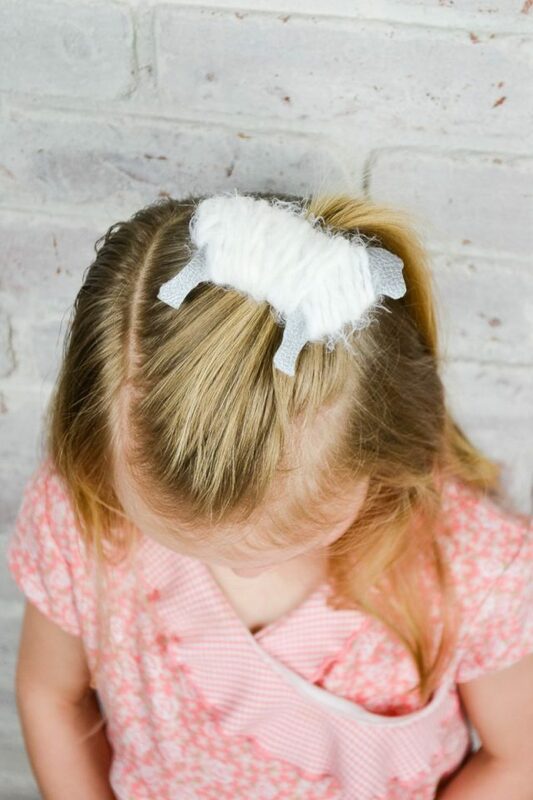 Hot glue an alligator clip to the back of the lamb. 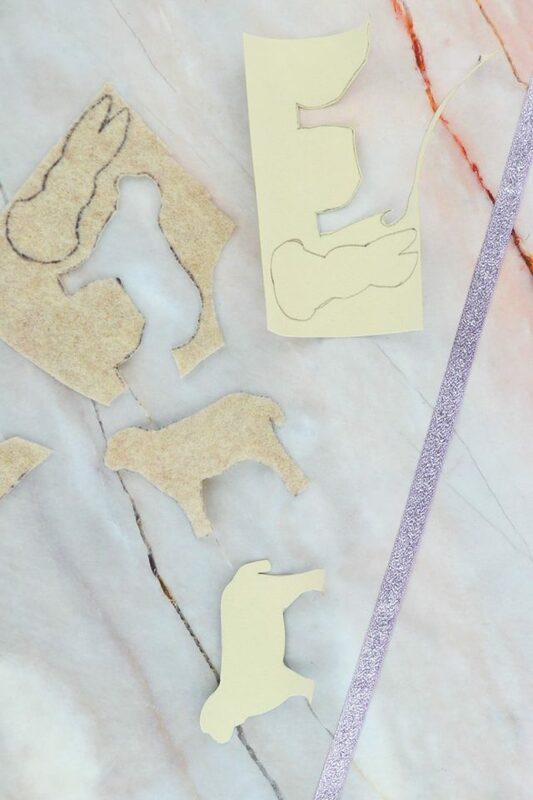 Cut out the two butterfly pieces from faux leather or leather. (You could even make it out of felt or paper if you wanted!) You can do this by hand or with a cutting machine. 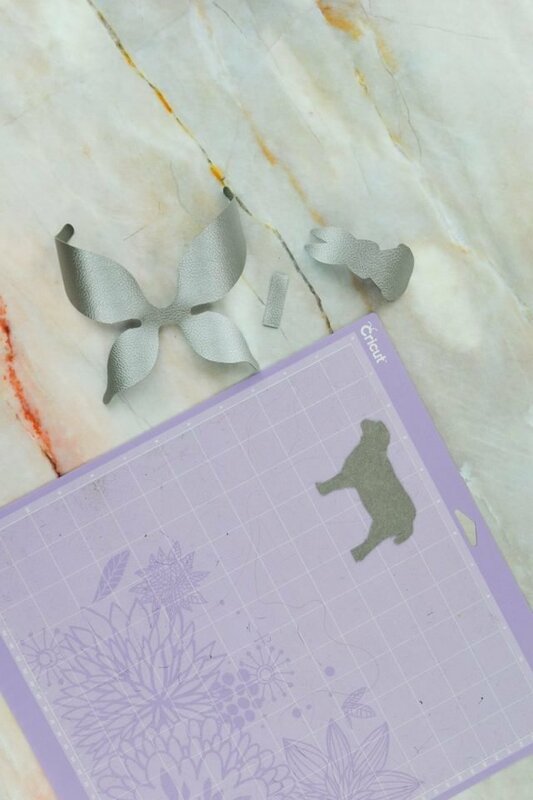 Cut out the iron-on vinyl with a cutting machine. Weed the iron-on vinyl. 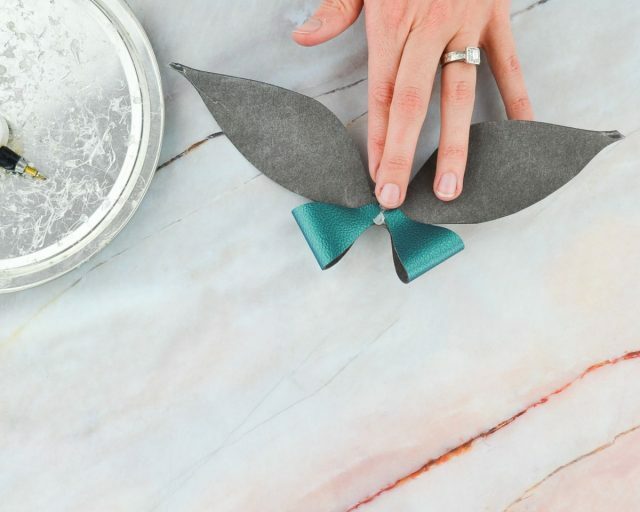 Fuse the iron-on vinyl to the outside edges of the butterfly pattern piece. I used the Easypress 2, but you can also use an iron. 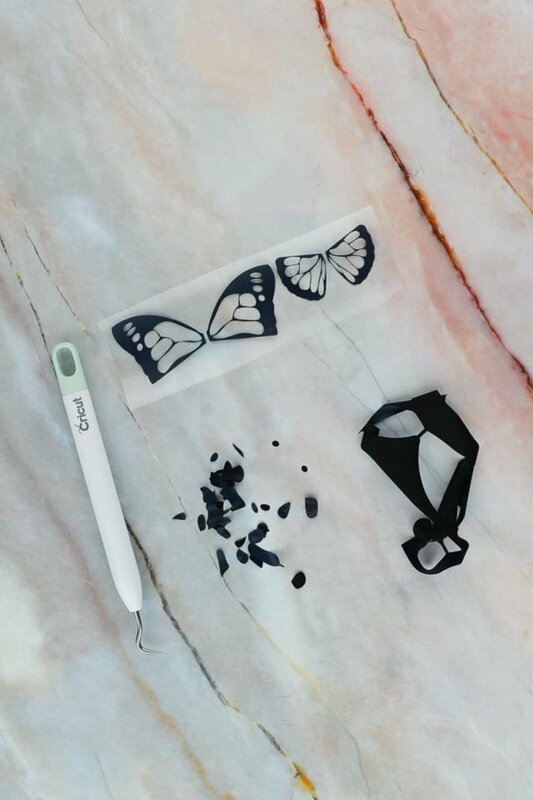 Put a dot of hot glue in the center of the butterfly. Fold the two small ends up and into the glue. Put another dot of hot glue in the middle of the butterfly. Fold the two top ends down and into the glue. Hot glue the small rectangle around the middle of the butterfly. 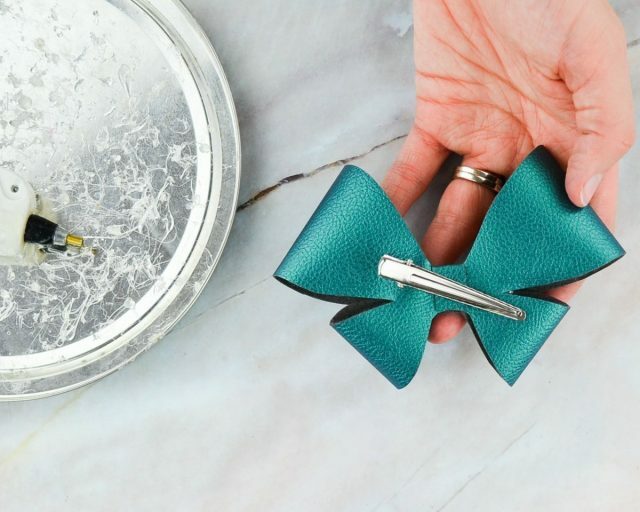 Hot glue an alligator clip to the back of the butterfly hair bow. Make lots more! 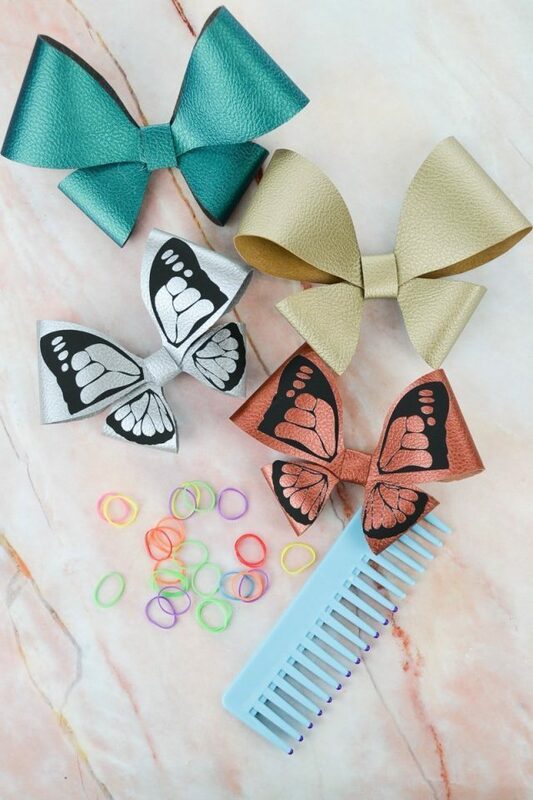 They look like butterflies with the iron-on vinyl, but they also look like cute bows without the iron-on vinyl. 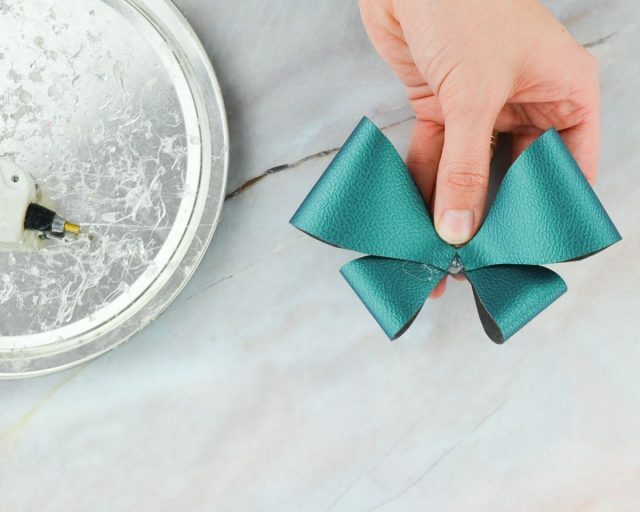 The free templates for these bows can be found in my subscriber library. Confirm that you want to be on my list to get the password! I’ve tried to subscribe to get the butterfly bow template and I entered the password but I am still not able to access the template. Can you help with this? It finally just went through please disregard. Yay I’m glad it worked! I have been trying as well for two days to get subscribed and it won’t work to send me passcode for your projects. 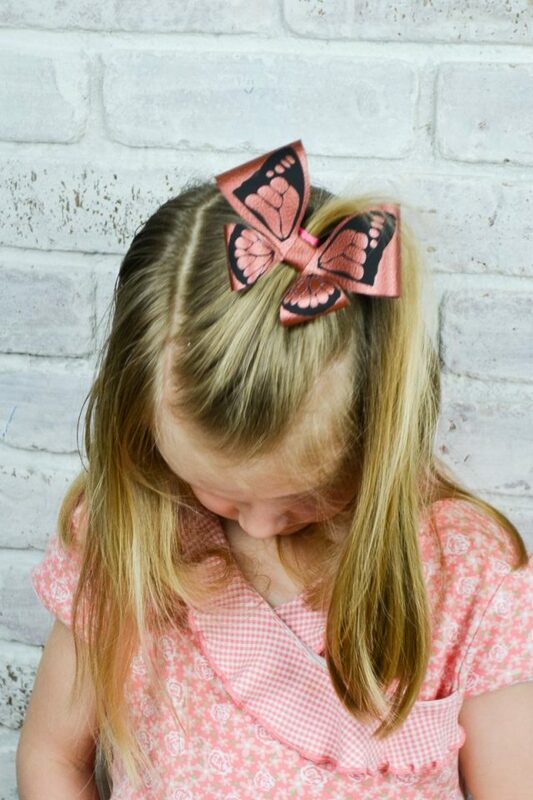 I have tried four times to subscribe to your newsletter in order to get the password to get the pattern for the hairbows and each time it does nothing. I have gone to the page in facebook then directly to the hairbow site and still nothing. Can you help me out please?